Moms, the Guilt & the Glory! As a Mom Boss, I can assure you I have felt Mother’s Guilt for many years. I would tell a story about being a “work at home & stay at home mom,” and that is the reason I built a business from home, but the truth was, I was on my computer & in my home office a lot. I was not present at times, and that became my challenge, opportunity & focus in most recent years. I felt guilty because I would rather be on my phone, than on the floor reading Brown Bear for the 50th time. I had to play mind games with myself, and make myself be present and in those moments-- I enjoyed it all, the kids, the business, the flexibility that I had, but it was far from perfect, it was the art of imperfection. The guilt was always deep inside because I felt like I could never do enough or be enough for these three little people that owned my heart more than anything or anyone in the world. Mom guilt is real. Over the years, while being a Momboss, I have enjoyed flexibility in a big way. For the most part, I have been able to design my life, and plan my work around my family, I am so very grateful for this, and it shaped who I am today. Let's be real though. To be successful, and grow my business, I had to sacrifice, I had to work hard, and while I loved it, it did pull on my time with my family, and my ability to be genuinely present in my life. Balance is an interesting theme, one in which I struggle with, and one in which I try and master now in my life. You reach a point in mid-life that you do prioritize what is most important, and what is not. The Ying & Yang of life, the Ying & Yang of being a Mom, which in my opinion is double the challenge on your heart, emotions, thoughts, & time. As a top leader in my business, I had to work hard to achieve that spot, to earn the income I was able to, and to teach many others to do the same. I would not change any of it for the world because if I compared what I did to what I would need to do if I worked full time for a company outside of my home, it was a blessing & gift to be home, have flexibility and be able to be in & out of my kids daily lives. While I was able to be there for so much, I also missed things too. Birthdays, big games, performances, school events—you name it, I have missed it as I needed to be on a work trip and or an event. Moms guilt weighs on us, but we need to remember that this is part of it all, we do need to miss some things, but we don’t need to miss everything! There are seasons in our lives; I have had many seasons in which I sacrificed, made the difficult choice to travel or work, and not be at home. Likewise, at this point in my life, I am making choices that honor the moments that matter most, as I am reminded we do not get these back. Most recently, I was faced with yet another schedule conflict, something I know so well after being a Mom Boss for over 16 years. When they were little it was easier, Cameron had no idea I missed his 2nd Birthday for a work trip, we just celebrated another day. My heart ached but he was none the wiser, cake and ice-cream made for a grand celebration, even thou it was four days after his actual birthday. Taking red eyes home to make it for some of Kaili’s dance competitions, although I was tired, I warrior-ed on & was there, be it late & exhausted! It is part of the gig, part of being a momboss or working mom. Our love for our kids is most important, but it does not mean we love them less when we are not there for the more significant moments. We can’t possibly do it all, but we can try and give ourselves and each other grace. We are all doing our best, whatever that means to us personally. This month was Cam’s Junior prom, my three babies are all teenagers, and I only have a handful (just a few years) to have these moments, these milestones, these times that mean more to me than anything. I had an important work conference, one in which I wanted to be at, and also needed to be at. I had to coach myself and treat myself like I would another Mom on my team. I would ask myself the question I would ask another woman: “What is going to matter most ten years from now”? The answer was clear but challenging, I only get one Junior Prom with Cameron, and I choose Cameron this time because years ago I didn't. I started this business so I could put my family first. I chose to fly to the event to see my team and make an effort to be there in some way—it was a quick trip but made me feel more connected. 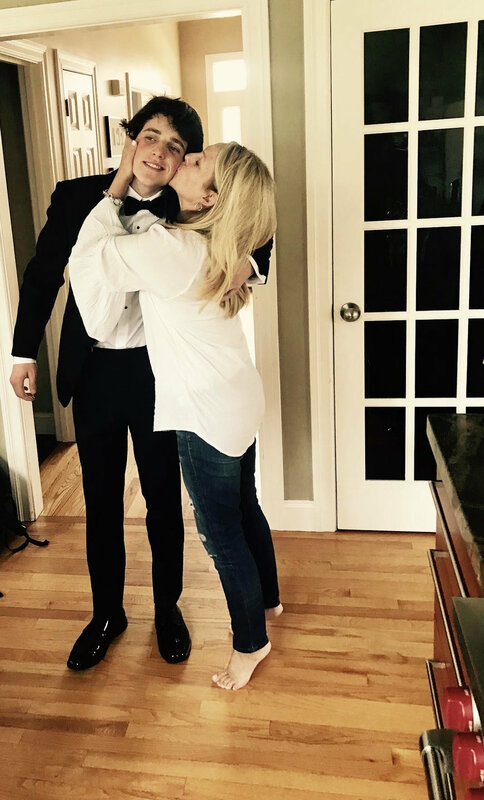 I flew home to see my Cameron off to prom, to be there for my middle son, the one that seems to go under the radar but deserves to be under a spotlight. It was his moment, and I was there. Now, if you are reading this and you were on a trip during prom for one of your kids, there is no guilt, no judgment because I have missed big events (and a few years ago missed Kaili going to a formal dance because of a work trip). We do the best we can when we can—remember the seasons in life. Let's celebrate the moments we can be there, and forgive ourselves and have more grace when we can’t. This was one of those moments that I needed as a Mom. At the end of my life, it is not about a business trip, title or what I accomplished, I want to be known for inspiring others, and most importantly, being a loving Mom. We can’t be there for everything, but when we have the freedom to make that choice and be there when we can, that is everything. And for that, I am grateful!